A taster weekend course was held by the branch on the 6th – 7th May 2017. A great weekend was staged even with the A465 closed and some members giving up whilst attempting to get there. 10 fresh and eager participants joined instructors Ken and Brian up on the very sunny Hatterall Hill near Abergavenny. 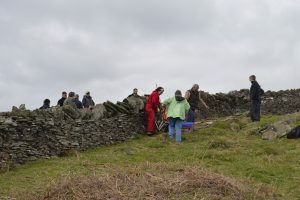 At a small holding of seven acres the course was treated to a cooked breakfast and several rounds of coffee before an ernest start up on a section of wall. A further four branch members attended the weekend with the aim of tackling a sweeping corner under the watchful eye of the Chairman John. 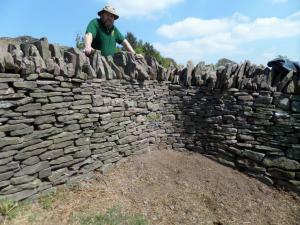 The taster crowd were shown how to strip and grade the stone on a section of wall. The weather was slightly overcast but mild and forgiving. Participants were soon throwing away warm hats and getting stuck into laying some good footings under tuition from the course instructors. Tea, Coffee and mint KitKats were brought up to the site by the owners of the small holding and everyone could sit back and admire the view over Llantony Priory and the Sugarloaf. Meanwhile down the slope members Jamie and Teg were shown how to create a sweeping corner by John. Lunchtime soon arrived and a delicious stew was taken alfresco overlooking the valley. The afternoon saw good progress from both work parties and both structures began to take shape. Another 8am start everyone looked fresh and eager to continue with the respective build. This was interupted by a fine serving of porridge and cooked breakfast, washed down by several cups of tea/coffee your report author was wondering if he would make it up the hill due digestive issues! Teg had brought reinforcements with him in the shape of a small dog called Mali. Later on in the morning another member Jeremy arrived to add his expertise the corner section. The day went exceptionally well and assisted by stunning weather the participants finished both builds. The outcome of the weekend was very positive feedback from all who took part. The branch would also like to welcome Chris and Tom who were so impressed that they joined the DSWA.